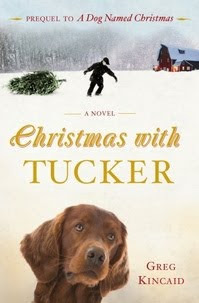 Christmas with Tucker , by Greg Kincaid, is a prequel to his already-released title, A Dog Named Christmas (which I have not read but was apparently turned into a Hallmark Hall of Fame movie.) If a prequel is going to be released second though, I'm glad I started with the beginning of the story, back in 1962. In this story we meet young George, who lost his father in a farming accident in the summer of the same year. Transitions have been sad and sometimes rough when George is put in charge of caring for the neighbor's dog during the holiday season. Before I get any further, I just want to say that although the title makes it obvious that this book is about a dog, and although the author is himself a big fan of these canine creatures, I didn't really feel like this book was about a dog. Sure, Tucker was a character in the story and you can feel his importance. Not being a big pet lover myself, I wasn't sure I'd be able to really get into this story but I was easily pulled in and came to love both this family and their adopted pooch. Kincaid, although dealing with something of a hefty subject matter, does not write this story in such a way that leaves you feeling sad or depressed. Yes, there are moments when you wish to change the family history in the book and you long for the way "things used to be" (perhaps a little in your own life as well!) At the same time, the reader can easily grasp hold of the hope that Christmas with Tucker has to offer. The refrain of the book is that although we may have suffered great loss in our lives, we can't change the past and we must learn how to keep pressing forward - with hope. No, this isn't a Christian novel but it plays out very well. I thoroughly enjoyed this Christmas story. Thoroughly. Kincaid creates characters that you believe in, root for, cheer on and, yes, sympathize with as well. The chapters are incredibly short making this 180 page book a quick and easy, and extraordinarily pleasant Christmas read. I definitely plan on keeping this story on my bookshelf for yearly re-reads and I'm looking forward to snagging a copy of A Dog Named Christmas also. If Kincaid writes any additional Christmas stories, I'll be right on them! I'm very happy to say that not only did The Crown Publishing Group send me a copy of this book to read, they also have offered a copy to one of my readers! Would you like to win this cozy and inspiring Christmas read? If you would, simply leave a comment below. This contest is open to U.S. Residents only and will be open through Sunday, December 5th. THIS CONTEST IS NOW CLOSED. THE WINNER (as selected by random.org) IS #31 - Cathy W. CONGRATULATIONS! Thank you, Crown Publishing, for offering us this wonderful story! Sounds like a really good book to read over the holidays. I may have mentioned this before, but I tend to avoid animal stories because they always make me cry. This one sounds quite hopeful though. Thanks for the review! I saw "A Dog Named Christmas" and loved it. Very sweet story. You'll have to watch it. Maybe I should pick up this book to read, too. It's a prequel? Hmmm... I wonder how the stories fit together? sounds like a great book what do you think about a 10 year old reading it?? I will read it for sure but I know by the picture my oldest will want to read it too. Here reading level is very high 7th grade but what about the content safe??? I love dogs... and Christmas! Perfect combination. It sounds like a good book and good writing, too. I think I'd like to give this book to my sister's boyfriend or my stepmother if I won. It sounds good, but also sounds llike a good gift book! We listened to the audio book of A Dog Named Christmas last fall. Then, we got to see the movie. We enjoyed both, and would love to read this new one. I enjoyed your review and would love to read Christmas With Tucker :) *Thanks* for the giveaway! I loved the movie and would love to read the prequel! Definately would LOVE to win this book! I have been hearing good things about this book all over the web! Thank you for this opportunity! This sounds like a heartwarming book, I'd love to read it. This sounds good! Please enter me, too. A cozy and inspiring Christmas read! AND I love dog books. So count me in, I'd love to win this. I am an animal lover so I love all books about them. Interesting that you said that this book deals with a heavy subject but doesn't drag you down. So that is another attraction to this book for me. I did see the show on Hallmark, 'A Dog Named Christmas' and loved it. The boy in the story had to be so determined to convince his father that he could be responsible for a dog. I would really love to read this book. OH I LOVE books about dogs and books about Christmas...Christmas With Tucker would be perfect! Thank you for the chance to win a copy. I loved A DOG NAMED CHRISTMAS and would like to read the prequel CHRISTMAS WITH TUCKER. I'd love a chance into this giveaway thanks! This sounds like a wonderful story. This book sound wonderful.Please enter me in the giveaway.Thanks for the wonderful giveaway.augustlily06(at)aim(dot)com.